U-Mind Space provide no information on their website about who owns or runs the business. The U-Mind Space website domain (“u-mind.space”) was registered on August 9th, 2016. Kevin Lee (right) is listed as the owner, with an address in the US state of California also provided. The address featured on the domain differs from the Californian address provided on the U-Mind Space website. The domain address is a residential property in La Canada. The website address belongs to Regus and is virtual in nature. Further research reveals the U-Mind Space domain address appears to belong to Lee (family home). Owing to the generic nature of Lee’s name and language barriers (Lee is fluent in Korean), I was unable to put together an MLM history. U-Mind Space has no retailable products or services, with affiliates only able to market U-Mind Space affiliate membership itself. Bundled with U-Mind Space affiliate membership is access to a bitcoin based e-commerce mobile app. The app also has various social communication features. U-Mind Space affiliates sign up and pay a fee. Commissions are paid when they recruit others who do the same. Positions in the binary team are filled via direct and indirect recruitment of affiliates. Note that there is no limit to how deep a binary team can grow. At the end of each day, U-Mind Space tally up new affiliate fee volume on both sides of the binary team. An affiliate is paid 20% of matched volume, with unmatched volume on the stronger side carried over for the next day. Commissions are paid at a rate of 1% of affiliate fees paid by affiliates recruited into the unilevel team. 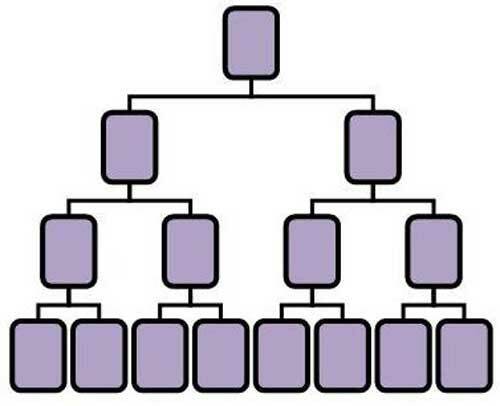 A definition of the recommendation tree is not provided in the U-Mind Space compensation plan. To qualify as a Count a U-Mind Space affiliate must have at least one hundred affiliates in their downline. To qualify as a Duke a U-Mind Space affiliate must have at least one thousand affiliates in their downline. Global Society of the members of all the Like-Minded Communities who collectively market, use & share the best product on earth. The U-Mind Space website has a lot of mumbo-jumbo about artificial intelligence, which seems to be their way of marketing the app. Major aspects of Psychology and Statistics are already in place and the upgrades for Image Recognition & Natural Language Processing have been in progress, as well as the digitalization of the Oriental Academic Heritage, including Physiognomy and I Ching. Buggered if I know what any of that means, but the app itself has nothing to do with the U-Mind Space MLM opportunity. U-Mind Space’s business model is straight pyramid recruitment with a layer of blatant securities fraud. U-Mind Space affiliates sign up, pay a fee and are paid to recruit others who do the same. The U-Mind Space app is available for free to U-Mind Commoner members, so affiliates are obviously not paying for access to it. The only reason fees are paid appears to be to fund recruitment commissions, the payment of which makes U-Mind Space a pyramid scheme. On the U-Mind Space website one can also find an “investment opportunity agreement”, which is provided to U-Mind Royal affiliates (invest $2000). 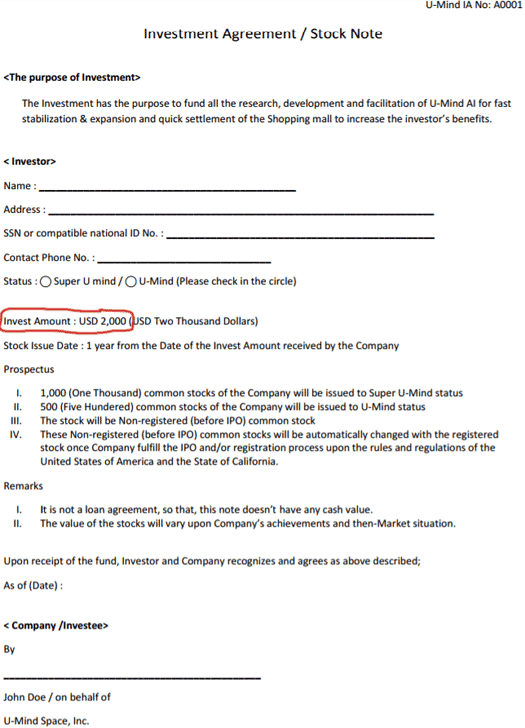 As per the agreement (click to enlarge), U-Mind Royal affiliates are given between 500 and 1000 “common stocks of the Company”. “The Company” identified at the bottom of the agreement is U-Mind Space, Inc.
A search of the SEC’s Edgar database turns up nothing for “u-mind”, “u mind” or any derivatives. This means neither U-Mind Space or Kevin Lee are authorized to make a securities offering in the US. Quite obviously the U-Mind Space investor agreement is a securities offering, which appears to be a case of securities fraud. The ruse behind the investment opportunity seems to be e-commerce activity through the U-Mind Space app. All the monetary transactions in U-Mind Space Should be through the BitCoin. Using BitCoin as the only currency removes all the hassle & problems in the international Transactions for Global Expansion. In addition to e-commerce transactions, this includes payment of U-Mind Space affiliate membership fees. So uh what? Kevin Lee is going to run an illegal investment opportunity from California, and hope the use of bitcoin throws off the SEC? Yeah, this probably isn’t going to end well. As with all pyramid schemes, once affiliate recruitment dies off U-Mind Space will collapse. The investor agreement states that stock will be issued “1 year from the date of the invest amount received by the company”. Alexa traffic estimates suggest U-Mind Space launched around late March. I’d be very surprised if U-Mind Space is still around this time next year. Even if the SEC don’t move to shut Lee down, U-Mind Space affiliate recruitment is likely to drop off before March, 2018 (the presentation of the opportunity on the U-Mind Space website is terrible). it is not a loan agreement, so that, this note doesn’t have any cash value. Once U-Mind Space inevitably collapses, anyone who hasn’t recouped their fees via recruitment will only have a worthless bit of paper to show for it.